Mesoporous TiO2 was synthesized via nonhydrolytic template-mediated sol-gel route. 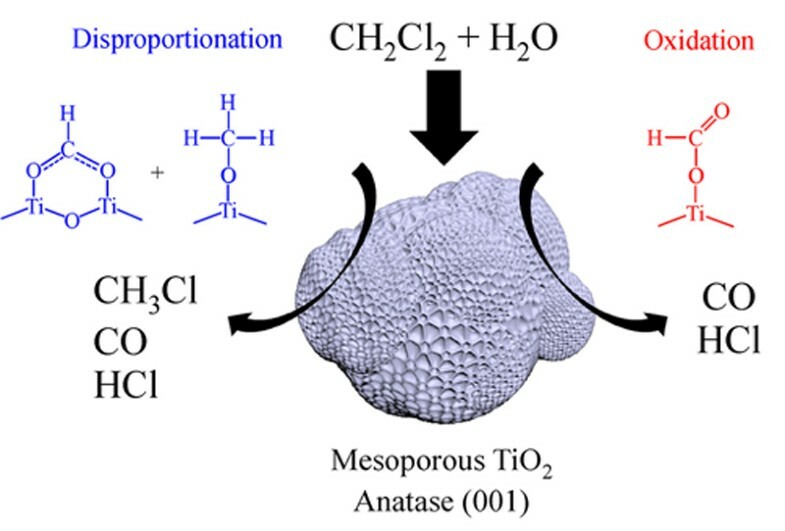 Catalytic degradation performance upon dichloromethane over as-prepared mesoporous TiO2, pure anatase and rutile were investigated respectively. Disproportionation took place over as-made mesoporous TiO2 and pure anatase under the presence of water. The mechanism of disproportionation was studied by in situ FTIR. The interaction between chloromethoxy species and bridge coordinated methylenes was the key step of disproportionation. Formate species and methoxy groups would be formed and further turned into carbon monoxide and methyl chloride. Anatase (001) played an important role for disproportionation in that water could be dissociated into surface hydroxyl groups on such structure. As a result, the consumed hydroxyl groups would be replenished. In addition, there was another competitive oxidation route governed by free hydroxyl radicals. In this route, chloromethoxy groups would be oxidized into formate species by hydroxyl radicals transfering from the surface of TiO2. The latter route would be more favorable at higher temperature. 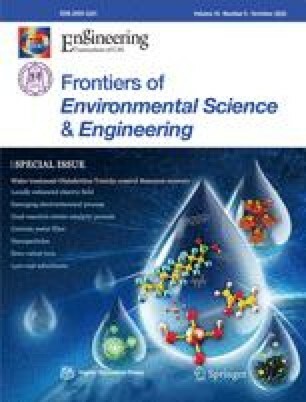 Supplementary material is available for this article at https://doi.org/10.1007/s11783-019-1113-8 and is accessible for authorized users. This work was supported by Key Program of the Chinese Academy of Sciences (No. ZDRW-ZS-2016-5-3) and National Key Research and Development Program of China (Grant No. 2017YFC0211503). Supplementary material, approximately 158 KB.